Use our CheapoAir promo code for an extra $10 off Hainan Airlines Las Vegas flights, including the all new direct service between Las Vegas and Beijing that started December 2, 2016. CheapoAir flights are already discounted, even before you enter the promo code. When we tested this code, the flight was considerably cheaper than on the Hainan Airlines site. Just click your friend Coupon Puppet below and enter AIR50 at checkout to try it out yourself! It was very big news when Hainan Airlines announced new nonstop flights from Beijing, China to Las Vegas, USA! We think the December 2, 2016 start date must have something to do with the new Chinese themed Lucky Dragon Casino opening on the Las Vegas Strip on December 3, 2016. Folks on the first Hainan Airlines Las Vegas flight from Beijing will be there to witness the lion dance at the grand opening! Not to mention try out the luxury tea room, explore the tastes at the five authentic Chinese restaurants, or maybe even be the first person to throw some money down at the baccarat table! So exciting! Please note Hainan Airlines Las Vegas – Beijing nonstop service is being offered Mondays, Wednesdays and Fridays only. The rest of the week you can still fly LAS-BJS on connecting flights. The CheapoAir promo code box is a little hard to find. After you select your flight, you’ll come to a page entitled “Review Trip Details and Book.” First, you’ll see boxes for Flight Details, Traveler Details, optional Travel Protection, and THEN you will see a Price Details box. Contained in the Price Details box is a link that says Promo Code. Click that little link and a Promo Code box will appear, next to the words “I have a Promotional Code.” Enter your CheapoAir promo code and click Apply to see your discount. 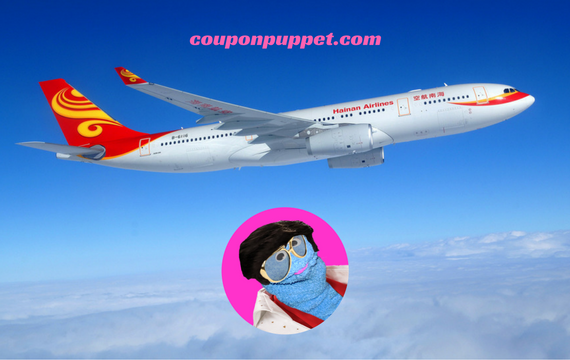 Coupon Puppet Loves Saving You Money On Hainan Airlines Las Vegas – Beijing Flights! Why Not Catch A Cirque Du Soleil Show While Visiting Las Vegas USA?